In the first year of your baby’s life there will be milestones that you look out for. Those big moments that you remember. The first time they did a mini-pushup, the first time that little chunker crawled, and the very first birthday of a lifetime of many. You want each and every moment on camera. True story time, parents. Many moons ago (I won’t tell you how many) when my first baby was trying to roll, I spent hours of my life encouraging him to roll, hanging out with him on his tummy-time mat, and other crazy things first-time moms do. This kid would not roll. One day I was grabbing tea in the kitchen and came back to find my darling had literally rolled off his playmat clear across the carpet. Insert jaw drop here! I was floored. Just like that, my baby was a whole new person. He was a roller! This is why you need baby milestone portraits. 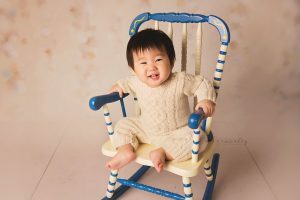 Every few months of the first year your baby will literally be a whole new person and you want to make sure you capture each of those cute new stages. I will custom design the session from outfits, to backgrounds, to props. I can completely relate to moms who love to shop for cute baby things (just wait til you see the studio collection!) so you are welcome to bring your own attire or use items from our boutique closet. I make the session experience so easy for you because as a mom of five little monkeys of my own, I know how busy you are. If your prefer, all you need to do is show up with your unbelievably adorable, squishy little baby. So let me welcome you to the Milky Monkey Photography family! Fill out our contact page or send me an email at milkymonkeyphotography@gmail.com. Tell me your story, tell me all about your squishy little love and how I can bring your baby milestone portrait vision to life! I’m so excited to meet you and get to know you! To book your Milestone Baby Session with Maryland’s Baby Photographer, email milkymonkeyphotography@gmail.com today! For a wonderful way to save on your milestone sessions, consider joining the LUXE MONKEY BABY PLAN. servicing Washington DC, Northern Virginia, and Maryland.